“I, Charles Meaney, am a native of Cork city. I joined the Fianna in Cork prior to the Rising of 1916, but when about 15 Fianna lads left the city for Macroom with the Volunteers on Easter Sunday 1916, I was not allowed to go with them as I was considered to be too young. 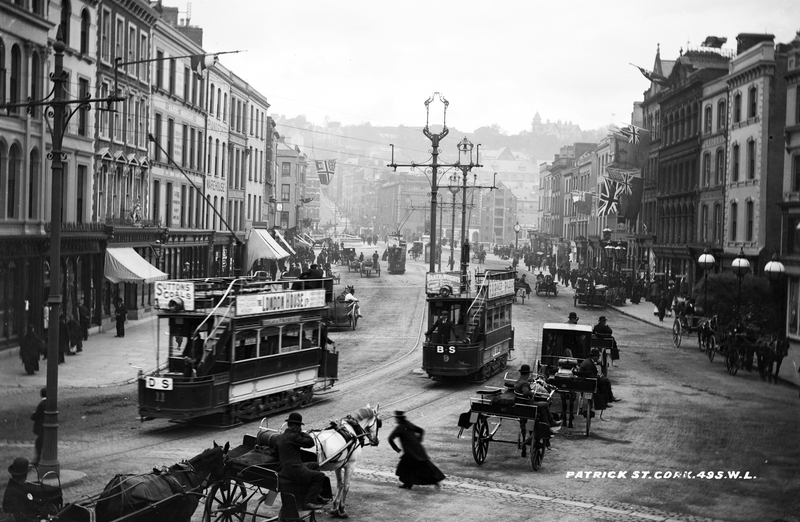 After 1916, we kept together and, later that year, so far as I can remember, the Fianna was divided into two companies, or Sluaghs, as they were known, one for the portion of the city north of the River Lee, and, one for the districts south of the river. We had about 60 lads in the organization at that time, but their number increased subsequently to about 100 on the rolls. During 1917 and 1918, our activities consisted of drilling, general training of a military nature, lectures in first aid and rifle shooting. A .22 rifle was used in the lectures on the rifle. We were also taught how to use a revolver of which we had just a few. Our headquarters varied from time to time. We met in ‘An Grianan’, Queen St., Cork; a room in South Main St., Cork; in Drummey’s premises, Pope’s Quay, and in McGurk’s in North Main Street. During the general election of December 1918, we were very active in distributing election literature for Sinn Fein, posting bills (sometimes at night during curfew) and generally helping out in the intensive propaganda efforts by Sinn Féin which were a feature of that particular election. We wore a uniform consisting of a blue short pants, green shirt, saffron scarf and green slouch hat. Fianna officers wore Sam Browne belts. When engaged on route marches we always wore this uniform, notwithstanding the ban placed on the wearing of military uniforms by the British, sometime in 1918, so far as I can remember. As a matter of fact, as the struggle developed in the years 1920-21, the really active members, of the Fianna in Cork could be said to number not more than 30; not all of these were armed; indeed, it would be safe to say that there were not more than a dozen revolvers in the Fianna during the hottest period of the fight, i.e., 1920-1921. Generally speaking, the major activities during this period might be summarised as follows: raids on private houses for arms; scout duty for the I.R.A. ; destruction of enemy stores; enforcement of Belfast boycott; dispatch carrying; and attacks on individual enemy personnel. These attacks on individual members of the enemy forces were a [common] feature of Fianna activities 1920-21. Three or four of us waylaid soldiers and Black and Tans who were sometimes in the company of girls, or, perhaps, leaving a public house in a drunken condition. Whenever the opportunity offered, we attacked them, took their equipment and, in quite a good few instances, got revolvers as well. This entry was posted on Thursday, November 27th, 2014 at 10:45 am	and posted in Fianna articles archives. You can follow any responses to this entry through the RSS 2.0 feed.